Practical and stylish, these clever purse shaped compact mirrors are sure to be a hit at your event! These dashing purse themed favors are popular for bridal showers, bachelorette parties or any women's events. 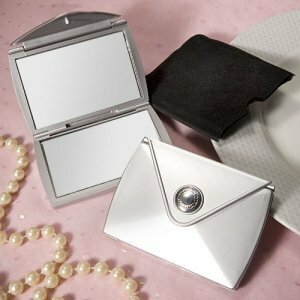 Each compact is 3 1/2" x 2 1/2" in silver matte finish, and is designed to resemble a "straight from the runway" purse with sturdy hinged construction and a decorative button snap that opens to reveal the double mirror interior. Each favor is slipped into a protective black felt pouch and packaged inside a white gift box.